We report on all visible major defects in our house inspection reports. A major defect is one of sufficient magnitude where rectification has to be carried out in order to avoid unsafe conditions, loss of utility or further deterioration of the property. Down pipes not connected to storm water discharge can be a major defect as water may flow under the home, cause footings subsidence and therefore further deterioration of the property. Other major defects include leaking shower bases, as this defect can cause timber fungal decay (rot) to the floor boards and the floor frame. See one of our house inspection photographs of same below. Some major defects can be construed as Structural defects. Excess water ponding under the home has the potential to cause differential settlement cracking, stump rot and therefore structural damage. If it is rectified early there may be no problems. See below re a recent house inspection photographs of major defects. Mr Inspector believes a thorough building inspection of any home will reveal every problem at a house before you buy. Mr Inspector has been operating for 15 years and has seen all types of building defects. The photograph depicted here was taken during a recent building inspection in St Kilda and shows extensive roof rust. These defects can not be seen unless you climb on the roof and to replace a rusted roof on a standard three bedroom home you are looking around $20,000. "This shows the importance of being thorough", says lead building inspector, Peter Alexander. Mr Inspector is a qualified building inspector operating in Melbourne since 2004 and has a vast knowledge of Building defects in homes. A recent building and pest inspection in Black Rock found excessive timber rot under a house which was caused by a leaking bathroom which was leaking at the time of the inspection. The main cause of leaks in wet areas is inadequate water proofing of the wet areas which is a persistent problem. To repair wet area and rot defects in a bathroom can range from $3500 to $15,000 and this depends on how extensive the water damage travelled and removal and replacement of tiles. Is Building Inspection Really Worth It? A Building and Termite Inspection in Melbourne can cost a bit of money if you keep losing at auction. Is the building inspection required or not or is it actually even worth it? We know it is as we see around 2000 homes a year and we see the problems. Mr Inspector carried out a building inspection in Frankston recently for a client who was initially undecided whether a building inspection was worth it or not. He believed the home looked in good order......Admittedly the home looked good to us from the outside as well. The photo above shows what we found. The entire roof frame had been damaged by fire in the past and in our opinion needed to be replaced. In this case the house was for sale and not auction. Our client bought the property and was astute enough o have a satisfactory building inspection clause written into his offer. In this case the building inspection wasn't a waste of money - he got his moneys worth and made money but negotiating a better price for the home. We understand it was around $15,000. One needs to remember that all houses have issues. In 15 years doing pre-purchase building inspections we probably find one perfect house per year and that includes new homes that we conduct hand over inspections on. A perfect old house is normally owned by a retired tradie who does nothing but walk around maintaining the home and the garden. When we come across one of the these we wish all homes were like it. Home buyers should not expect the house they are buying to be perfect because it won't be. They need to expect that there will be maintenance issues that require repair or further monitoring. All old homes have them an they are no different from a car in that continual maintenance is required. In my opinion, a home buyer shouldn't get overly concerned about a bit of rot in a window frame, a cracked window pane, rusted gutters or the fence falling over. If you are going to worry about those issues and you are wanting to purchase an older home, you will never buy one. You are somewhat crazy if you don't get a building inspection even if you have to fork out money for a few. We have had clients not do it because it costs too much over time and regretted it. There's some articles on my website about that. If you got a $20,000 car tested and it failed, would you not get the next one tested because you had to pay again? Its too much of a risk for around $500.00. Mr Inspector, a qualified Building Inspector operating since 2004, conducts professional House Inspections Melbourne wide, assisting home buyers and owners. The photograph above depicts one of the tools that is essential to completing a thorough house inspection on any home. Using moisture meters helps us identify leaks from roofs that are still leaking, leaks from shower recesses, laundry tap wares, excessive damp on floors due to excess damp under a home and also rising damp. A common issue we come across is leaking bathrooms and this is normally caused by inadequate waterproofing of shower recesses and floors. There are now a number of updated building regulations that stipulate how a bathroom is to be waterproofed. For example, where you have an unenclosed shower which is common these days, the entire floor must be made water proof. It is very difficult to ascertain if waterproofing has been correctly carried out when we do the house inspection as one would need to remove all the tiles. 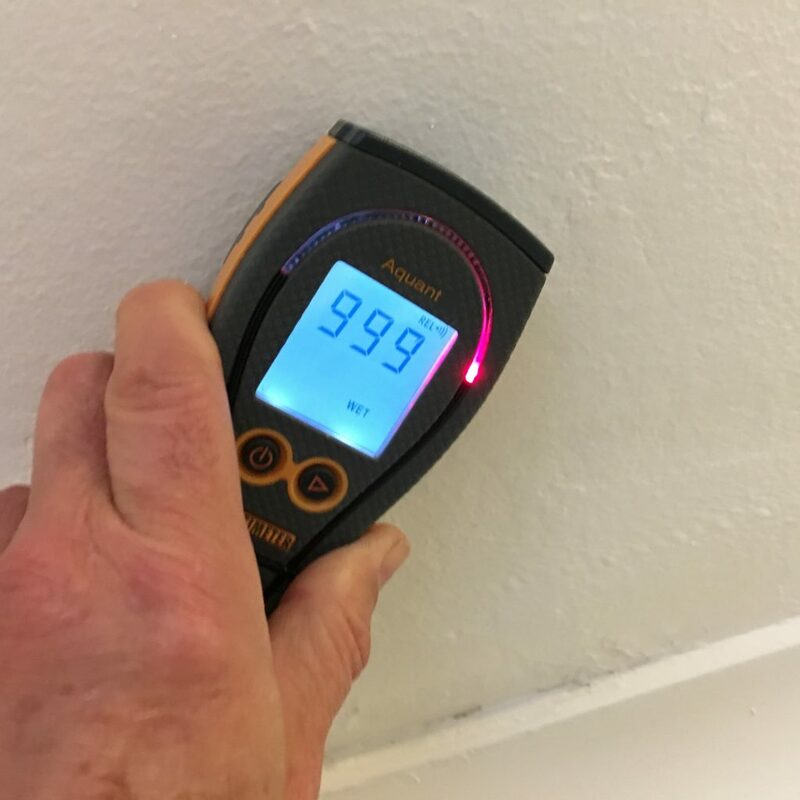 One sure sign that it hasn't been adequately waterproofed is the presence of excessive moisture readings on lower walls which sometimes, depending on how often the shower gets used, is not visible. The other sure sign is under the the shower if constructed with a suspended floor construction, e.g. stumps. To conduct an accurate and thorough house inspection in Melbourne it is not only essential that your your building inspector is qualified (Diploma of Building Surveying) but just as essential is that your inspector must have the right equipment for the job. These inspections are visual inspections only and an inspector can not start pulling everything off someone's walls. Must Have Equipment includes a monocular for seeing on upper roofs, moisture meter, Termatrac Radar meter for observing termites moving behind walls and a Thermal imaging camera. Mr Inspector is one of a few qualified Building Inspector in Melbourne conducting pre-purchase house inspections and pest inspections for Melbourne Homebuyers and has been operating since 2004. The photograph above was taken during a recent house inspection in Melbourne and shows decayed floor joists and bearers under a bathroom. Water leaks from bathrooms is one of the largest complaints that the Victorian Building Authority receives. Leaks are normally due to old age issues or in newer homes it is due to inadequate waterproofing on wet areas like shower recesses and floors. Today's requirements for unenclosed showers requires builders to waterproof the entire floor of the bathroom. Prior to the recent requirements, all the builder or tiler had to do was waterproof the shower base and not the flooring outside the bathroom. Almost 50% of building inspections Mr Inspector carries out reveals leaks from bathrooms. Continual leaking not only rot the timbers beneath but also attracts termites - termites need moisture and wood and come from the ground to these favourable conditions. The sub floor of older homes must be inspected to ascertain if leaking and leak damage is present. The costs to rip up a shower and floor tiles and then replace it all can range from $10,000 to $30,000 in rectification works. For any queries, please feel free to contact Mr Inspector to discuss. Mr Inspector is a qualified Building Inspector in Melbourne having completed a Diploma in Building Surveying and been operating since 2004. The above photograph was taken at a building inspection in Sandringham and shows poor workmanship regarding a plumbing penetration. This has the potential to cause further brick cracking up the wall unless adequately sealed and grouted. Having your potential home inspected thoroughly before you buy will place you in a position where you can negotiate and also ascertain all the potential costs of any rectification works required. This defect is a relatively cheap and easy fix. The above photograph depicts excess water ponding at the base of a stump footing which over time can cause extensive settlement in footings and foundations, movement cracking in external and internal walls and floor unevenness. This excess water is technically considered a major structural defects as it has the potential to cause one, albeit it hasn't caused problems at the moment. A plumber would need to be engaged to assess all pipes and drainage around the home to ascertain the cause. Mr Inspector is one of a few qualified building inspectors operating around Melbourne and assisting home buyers make an informed decision before they purchase a home. The above photo was taken during a recent building inspection in Gardenvale, Melbourne and depicts a table leg being used as a stump footing - at least they had it varnished. This shows the importance of having an inspection carried out on a home before you purchase. The original red gum stumps were decayed and easily wobbled. Re-stumping was required after obtaining a building permit to do so, but instead this owner had old table legs placed beside the decayed stumps. The yellow color in the floor bearer is powder post borer damage. Mr Inspector, a qualified building inspector in Richmond recently conducted a house inspection in Richmond and the above photograph shows excess moisture readings on a lower wall. It is imperative that building inspectors assess moisture levels on lower walls behind bathrooms and showers during all inspections. The use of moisture meters for a building inspection is not a requirement under the Australian Standards but Mr Inspector believes it is essential to check around wet areas for any leaks. This includes inspection of the walls adjoining bathrooms. In regard to the above photograph, it was ascertained that a leak had developed through the shower tap spindles and all that was required was to have the tap penetrations siliconed up to prevent water ingress. This defect would never have been detected if a moisture meter was not utilised on the lower walls in the adjoining bedroom and shows the importance of engaging an experienced building inspector who also has the right building inspection equipment and is willing to go outside the requirements of the Australian Standards. If you have any questions please contact Mr Inspector and he will be able to assist with all you inspection needs. Mr Inspector is a qualified building inspector with a diploma of Building Surveying and carries out pre-purchase building inspections Melbourne. The above photograph was taken during a recent building and pest inspection in Gardenvale, Melbourne and depicts a common rafter that has been cut to accommodate a sky light installation. This is commonly seen and although should not cause any problems it would not be advisable to walk on the roof above. Additional support for the tile load above should have been installed to comply with Timber framing standards. Worst case scenario here is that the tile weight may cause some sagging and potential leaking. It is a relatively easy and inexpensive fix.